Probo is a free Windows Application, included with the companion CD. Although the 5 Pin XLR is the standard DMX connector, the majority of popular DMX products in existence use a 3 Pin XLR. 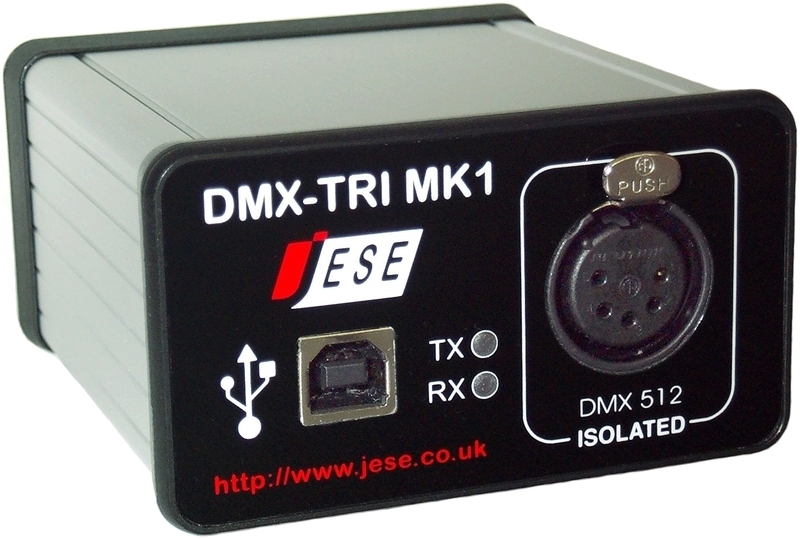 The DMX-TRI is available with the standard 5 Pin DMX Connector or the popular 3 Pin XLR. The TRI will generate DMX Universe frames asynchronously at rates configurable between 1 to 40 frames a second. Options are available to update the entire frame at once, a single slot within the frame or to insert a single frame into the transmission sequence. The TRI provides synchronous and asynchronous modes for monitoring DMX Frames, giving the application the flexibility to react only when frame data changes. The DMX-TRI can be licensed to be fully operable with GetSet, a Windows RDM Control Application. The upgrade path assures your hardware of a long and adaptable future, making it a sound investment. Site created and maintained by JESE Ltd.